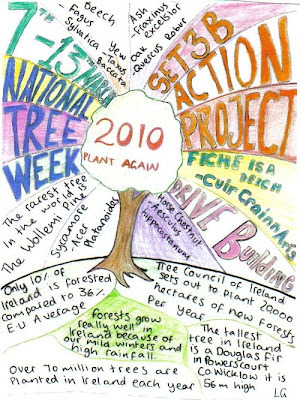 This is National Tree Week, and Mr Swift's IIIb CSPE set have planted a mountain ash as their Action Project; see a report on the College site here. So it's appropriate to have as our 61st Poem of the Week one of the great poems about trees, Gerard Manley Hopkins's 'Binsey Poplars'. Poster (above) by Lily Guinness.